Do you ever feel like your favorite brands are following you online? Then the sneakers start following you everywhere - when you’re checking the news, reading your favorite food blogs, and even shopping on other sites. Every time you see the sneakers they become a little more awesome, and your urge to buy them becomes a little stronger, until eventually you pull the trigger and convert. That’s remarketing - the practice of targeting customers with advertisements outside of your website or app, based on how they’ve engaged with your brand. Remarketing, also known as retargeting, is incredibly effective because it taps into human psychology. The more we see personalized ads for products we’ve already demonstrated interest in, the more those products grow on us and become “must have” items. It’s the inverse of buyer’s remorse - instead of regretting a purchase, remarketing makes us regret not making a purchase. It’s bad news for consumers on a budget, but great news for marketers. Remarketing is now an indispensable digital marketing tactic, and its value extends beyond physical goods to include subscription services, brand engagement, and now apps. We’ve got the scoop on how apps can take advantage of remarketing to drive customer engagement, retention, and LTV. Unless your app was a viral hit, chances are you’ve spent a lot of time and money acquiring new app users. According to Bain & Company, it costs 6-7x more to acquire a new customer than to retain an existing one. 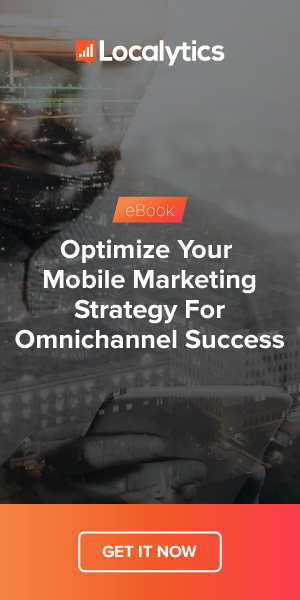 Ensuring that your acquisition campaigns not only drive downloads, but bring valuable, long-term users into your app is key to your marketing ROI. Unfortunately, Localytics data shows that 20% of apps are only used once. So what can you do to ensure your app isn’t in that 20%? Remarketing can help you keep customers engaged, increase LTV among existing customers, and ultimately boost the ROI of your acquisition efforts. Until recently, app marketers have had very limited opportunity to engage with users outside the app. Push notifications provide one channel, but Localytics data shows that 48% of app users opt-out of push. How can you reach those users and bring them back into your app? Email is one option, but many apps don’t require email addresses for sign-up. Remarketing provides another channel to engage users outside the app by targeting through Facebook, Twitter, and any other mobile advertising network. Like all app marketing, remarketing advertisements work best when they are targeted and personalized for the audience. Remarketing, in particular, is premised on the idea of targeting users based on their previous engagement with your brand - products they looked at, activities they did, etc. Personalization is key to high ROI in your remarketing campaigns. This is the classic remarketing use case, as demonstrated in the sneaker example at the beginning of this post. An ecommerce app can target people with remarketing ads for particular products they’ve viewed, favorited, or added to cart in the app, to drive conversions from their active customer base. Apps that don’t sell physical goods can use this strategy too. If you have a conversion funnel in your app, you can identify the steps in the funnel that users do before converting. You can target users who have done the preliminary steps but not yet converted with remarketing ads encouraging them to convert. For example, an international calling app defines conversion as a user’s first call through the app. They know that users are most likely to place a call after they have synced their contacts with the app. They decide to target remarketing campaigns to users who synced their contacts, but haven’t yet placed a call. This is the top use case for freemium apps that monetize through subscription services. The freemium model works by providing just enough value to get users hooked, and then upselling the most engaged users to premium plans that add additional value. Freemium apps can leverage remarketing to target “power users” of their free service - people who visit and use the app frequently, with advertisements for subscription plans. Targeting “power users” ensures that you’re only reaching people who understand the value of the product and as a result, are more likely than the average user to make the leap to a premium version. This final use case is applicable to all apps. Remarketing gives you an opportunity to extend a lifeline to users who haven’t visited your app in a while and may be at risk of churning. An app that is used frequently, such as a gaming app, could target users who haven’t played in the past two days but have been active in the past week. An app that is used less frequently, like a travel booking app, could target users who haven’t booked a trip in the past three months, reminding them to book their next trip through the app. Facebook, Twitter, and other mobile ad networks provide opportunities for app marketers to reach users outside the app with advertising campaigns. If you’re already partnering with an advertising network for your user acquisition campaigns, setting up remarketing campaigns over the same network won’t be hard. The tricky part is targeting the right users. You’re likely capturing a lot of information about your users and what they do in your app. You need a way to connect this data to your advertising networks in order to drive smart, targeted remarketing campaigns. An app analytics and marketing solution that enables you to capture user data, group users based on that data, and share that information with your advertising partners is key. As solutions become more advanced, it will be easy to share remarketing audiences with your advertising networks, create and run targeted remarketing campaigns, and track the ROI of those campaigns and impact on customer lifetime value.